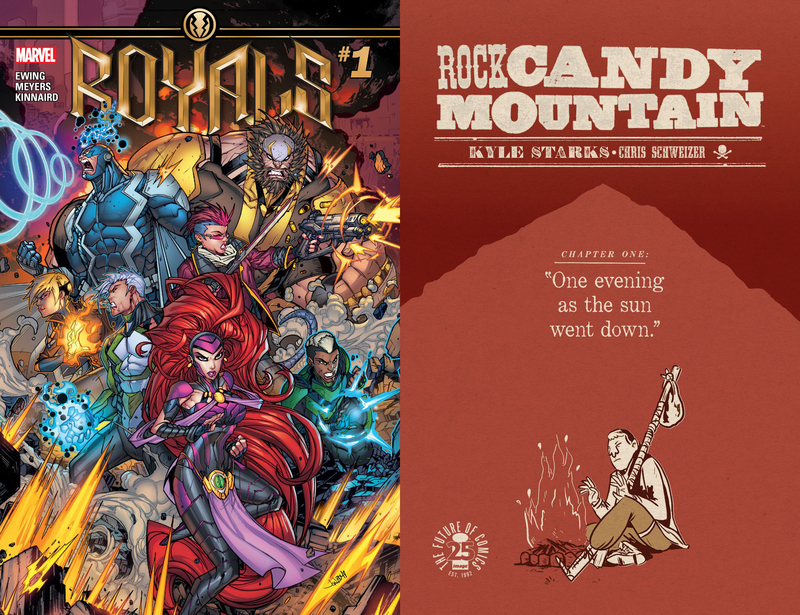 Home »Comics»Deadshirt is Reading: Royals and Rock Candy Mountain! I enjoyed Charles Soule’s four-year run on the Inhumans franchise, but it veered wildly from the core concept that made the characters work for so long. There was a great deal of speculation regarding the corporate positioning of the Inhumans franchise at the time, and Soule positioning the existing Inhumans as teachers to a new generation of powered characters globally certainly didn’t harm the perception that they were attempting to replace the stalwart X-Men franchise out of frustration with the Fox Studios contract. As a result, it turned the franchise into, well, the X-Men concept minus all the characters you know, and also reduced the once-unknowable, mysterious Inhumans into ersatz X-Men. Last week’s Inhumans Prime set the stage, but things really roar in this first issue of Royals as Al Ewing and Jonboy Meyers endeavor to make the Inhumans weird again, and thank God for that. The Inhumans shouldn’t be relatable, except in broad strokes terms; they’re a family, but everything’s writ large in that Kirby style: a usually-silent father with a booming voice, a rebellious daughter who rejects her birthright. By teaming up with Noh-Varr and going into space in search of the secret origin of Terrigenesis, the Inhumans are going from off-brand Claremont to full-on Kirby, and it’s an absolute relief. If you’ve read Ewing’s other Marvel work, you’ll know how good he is with far-out sci-fi concepts grounded by character, and this is no exception. The real surprise is artist Jonboy Meyers. When I saw the cover of the first issue, I was, to be honest, dismayed; it’s an overly busy generic team action shot, all ripped muscles and gritted teeth, with very little separating foreground and background. The interiors, thankfully—and I suspect colorist Ryan Kinnaird has a lot to contribute to this—are vastly different, with Meyers drawing bizarre alien landscapes and ornate new costumes with aplomb. It’s not a fit that I thought would work at first, but I find myself really enthused about this collaboration after seeing the final product, which is always a pleasant surprise. Anyway: the Inhumans are, finally, the Inhumans again; weird, wonderful and unknowable yet uncannily familiar. I can’t wait to see where they go next. Kyle Starks’ comics are basically hilarious high concepts where the joy is watching him go wild with what is essentially one big joke. His “debut” graphic novel The Legend of Ricky Thunder was essentially a wrestling creation myth, and his critically acclaimed Sexcastle both parodied and embraced the absurdity of the John Wickian movie super-badass assassin. Rock Candy Mountain is more of the same, but in a good way. Colorists are undervalued and it’s worth pointing out that Chris Schweizer’s sepia browns and reserved denim blues feel extremely important to the rural post-war feel of the book. Stylistically, Starks’ sparse style is a big departure from other books in Image’s current stable but it’s always impressive to see how detailed and eye-catching his fight sequences are. This is a comic that opens with the literal devil murdering hobos and boy does it deliver on that promise. Writing-wise, Starks does a nice job of coming up with some immediately interesting and funny characters like the Candy Rock Mountain-questing Jackson, down on his luck loser Pomona and evil fauxbo gangster Marion Flimbo. There are at least two jokes in the issue that made me laugh out loud and, hey, it’s a nice brisk read. If there’s one real downside to the issue it’s that it left me wanting to read the next issue immediately, preferably with some hooch down by the train tracks.